Let us be honest: Early Man is a little bit dumb. Or it is, at any rate, so unbelievably silly that it comes off as dumb, albeit dumb on purpose. The latest film produced by the great Bristol-based Aardman Animations, and the first feature directed by the studio's creative soul Nick Park since 2005's Wallace & Gromit in The Curse of the Were-Rabbit, is nearer the low end of the studio's output than the high end: of Aardman's seven features, this is a pretty comfy #6, above the pleasant but anodyne The Pirates! In an Adventure with Scientists from 2012, and below absolutely everything else. Still and all, I would much rather have a fairly low-key, disposable Aardman film than none at all, and given the perilous state of stop-motion animation, and the absence of a Phil Knight-style billionaire to keep funneling money into the studio just because he's an indulgent dad, I'm disinclined to look down my nose at anything Aardman manages to turn out. Besides, "silly" is only a pejorative if you're a bit of a prig. And the silliness on display in Early Man is more adorable than anything else, mildly prideful in the way of a film that has pursued a goofball concept all the way to completion, without any visible strain or effort. That concept being: what if cavemen played football? * What if, in fact, cavemen invented football, and that invention was, in the fashion of 2001: A Space Odyssey monolith, the source of all subsequent civilisation? This is exactly the scenario the film lays out in its opening sequence, set in the primordial forests of what will, millennia later, become Manchester, England (the film is not merely willing to make eventual "Man United" jokes - to say nothing of the punning overtones of its title - it seems that the ability to make those jokes was a primary reason it was made). From there, flashforward several dozen generations to find a small group of cavemen descended from those early footballers, living in a lush forest that remains in a crater otherwise surrounded by desolation. The memory of the game has been lost, and the tribe contentedly spends its days hunting rabbits. The only exception is the eager, optimistic, rock-stupid Dug (Eddie Redmayne). The crater is sitting just above a huge deposit of bronze, and it's the tribe's poor fortune that the Bronze Age is about to invade in the form of a petty tyrant named Lord Nooth (Tom Hiddleston), an anachronistic parody of a Frenchman with a fetish for bronze. Long story short, the very self-aware Bronze Agers are going to use all their technological might to wipe out the not at all self-aware Stone Agers, unless Dug can help his people rediscover the deeply buried football gene. So yeah, it's an underdog sports movie, set in a plasticine universe perched between prehistoric Europe and ancient Babylon, populated by modern English, French, and German stereotypes. The whole thing is cheerfully daft, absolutely rotten with the easiest jokes you could possibly imagine, on top of the how you can probably already predict, in fair detail, what happens in the third act based just on my paragraph-and-a-half of plot summary. Granting all that, Early Man charmed the pants right off of me. This sort of anachronistic slurry, wedging weird contemporary reference points into a fantastic cartoon set 6000 years ago, could be deadly in the wrong hands: the hands of, say, just about any American animation studio (there are ways in which this feels like what DreamWorks used to do all the damn time, before they started to work it out of their system around 2010). But the shuffling, modest tenor of almost every other Aardman production to date (their CGI work is substantially noisier) is on full display, and that helps a lot: the humor is squarely in "dad joke" territory, and the film never pretends for an instant that it's particularly clever or witty or anything. It's just corny, sweet, and fun. The other thing, of course, is that Aardman's filmography, since the very beginning, has been dominated by a very particular aesthetic: stop-motion animation that blatantly telegraphs its clumsy, hand-made nature (they've even created an algorithm to random place smudgy fingerprints on the CGI models that sometimes have to show up in their movies), with mushed-up clay figures meandering through little dollhouse sets. Compared to Laika, the world's only other significant stop-motion studio, Aardman is all about gentle, tactile, crude work, looking like something that tumbled out of a toybox and was set upon by a particularly creative child with a particularly absurd sense of humor. And this is, to no real surprise, the biggest strength of Early Man: the warm, handicrafted sensibility of the sets and puppets works hand-in-hand with the cornball jokes and outright provincialism around English football to create an overall vibe of people incapable of taking themselves seriously, who had a very fun time putting this whole thing together, and that fun exudes from every frame of the movie. 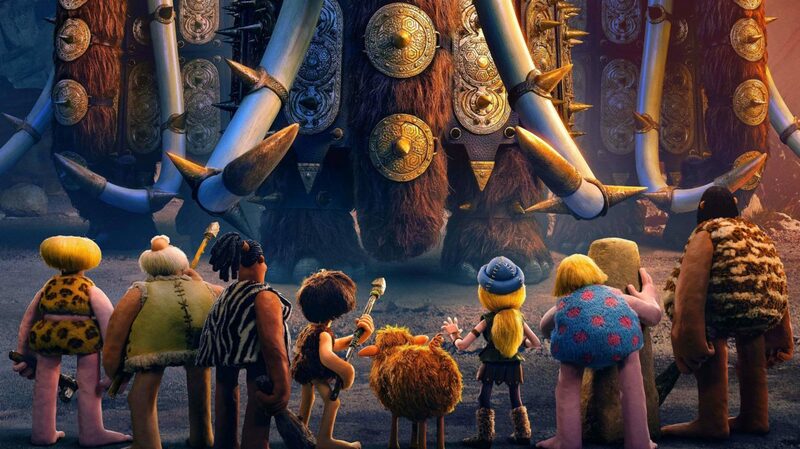 It is, honestly, maybe the most enjoyably-designed Aardman film yet made: while most of their previous films have a distinctly homey, nostalgic Britishness to them, Matt Perry's production design shows off the most overtly fanciful sets they have built, particularly in the garish Bronze Age city, an irreverent marriage of numerous ancient world cultural references mixed up with some fine, awful puns. The sets are the most overt way in which Early Man foregrounds how damn happy the filmmakers were to be able to make a film in this fussy, intimate style; it is, more than anything, a film in love with its own technique and models. Almost the very first thing we see is a pair of dinosaurs fighting exactly in the fashion of the triceratops vs. ceratosaurus battle Ray Harryhausen put together for One Million Years B.C. (the animals are named Ray and Harry in the end credits, an achingly sentimental gesture that would have made it quite impossible for me to ever give the film a negative review under any circumstances), a very direct and unapologetic bit of self-love for the film's medium; thereafter, all adorable Aardman rabbits, lovingly-detailed giant carnivorous ducks, elaborate sets, and squishy facial expressions are as much about showing off the soft tactility of the studio's style as they are about doing anything else. The result might not be a particularly impressive film, and it damn sure isn't a surprising film, but it is a wonderfully pleasant & pleasurable film. It's a film made by people who love fussing over little tiny details, for people who love watching things that were fussed over; it's not the kind of imaginative triumph that Aardman made its reputation with, but it's still more personable than almost anything else that gets made in any form of animation these days, and while I hope that 2018 produces better animated features, I don't know that I expect to see one that's more affable. *It's a British film, so I'm using British terminology, but if you're American, mentally substitute "soccer" every time you see the f-word. Also, pretend I said "The Pirates! Band of Misfits" in the lede.